Summer is coming and new travel challenge are expecting for the people who prefer adventurous vacation. Naturally, most of the tourists would choose beach holiday for relaxation, but Ukraine offers an interesting alternative of tourism. Eco-Traveling is relatively recent meaning in the world of tourism. First of all, it does not attract masses, so it can be called an exotic rest. The second advantage or disadvantage (depending on the person’s preferences) is the traveling on your own. You can drive a car, choose railway transport or even bike to get to the final destination. Some tourists consider it a bit romantic. If you visit destinations.com.ua you will find a lot of tourism opportunities offered by Ukraine. The following information will be appreciated by those, who want to experience camping travel in Ukraine. This Ukrainian resort is located in the western part of the country. This area is famous for its healing waters. The Shajan resort is annually attended by hundreds of tourist and offers many attractions including historical monuments like castles and fortresses; healing procedures such as therapeutic muds, healing waters; and incredibly beautiful views of the nature. The infrastructure of camping place provides all the necessary facilities such as power, water connection, food provision facilities, firewood etc. This place is located not far from Lviv. It is translated into English as “the Vikings’ bay”. This camping spot is very attractive and provides a well developed infrastructure. In addition to camping opportunities, Buhta Vikingiv offers hotel rooms, restaurant and various solutions for leisure and recreation. The entire place is designed in theme-related manner that brings a special zest to this place. If you need a camping place located closer to the sea, it is recommended to visit Solovinaya Rosha. This health resort is situated right on the shore of the Black Sea. The place offers a good infrastructure for camping travelers and many solutions for healthy and ecological recreation. The peak season starts here since May. This place will suit those who want to cut off from the world for a while. The place is located in in the Buky Village in Cherkasy region. The picturesque canyons of the Mountain Tikych River are surrounded by waterfalls and cliffs. Almost everyone, who finds himself in this place, feels immersed in the charming beauty of nature released of all civilization means. You will get everything you need for a great vacation in this camping place. 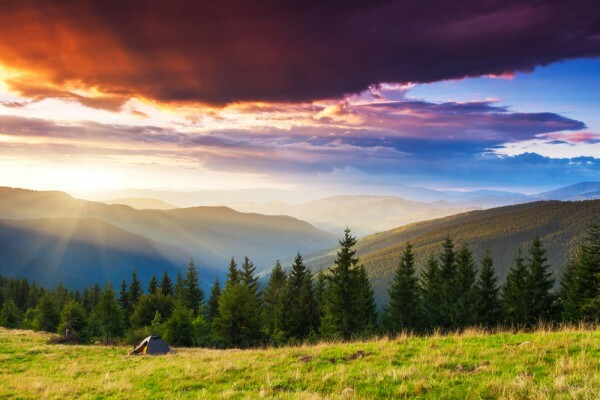 This spot for camping traveling is located in the northern part of Ukraine. The lakes are really magnificent providing crystal-clear water and picturesque nature all around. The nearest settlement to the lakes is Oleshnya Village in Chernihiv region. The campsite located near the Large Blue Lake offers own beach, playgrounds and water attractions to its visitors. If you want, you may book a wooden cabin instead of a tent. Ukraine offers many other camping locations, have fun and be adventurous. wished there were pictures of the places you mentioned, coz it all seems very interesting.